Average UK wages experienced stronger than expected growth between May and July as unemployment fell again. The Office for National Statistics (ONS) said average pay was 3.5% higher than at the same time last year. The rise came despite public sector wages growing at their weakest rate since May 1998. The unemployment rate was unchanged at 5.45%, while the number of people claiming benefit fell to its lowest level since April 2005. There were 852,900 people out of work and claming benefits in August, a drop of 4,200, which was much smaller than expected. The International Labour Organisation (ILO) measure of unemployment, which counts the number of people out of work and actively seeking employment, fell by 28,000 to 1,649,000 in the three months to July compared with the same period of 2006. "Pay growth has picked up a little but overall wage pressures remain subdued," said Philip Shaw from Investec. "The divergence between public and private sector wage growth shows the squeeze that is being placed on public sector pay," he added. 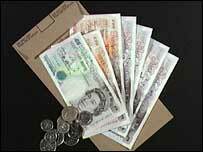 The ONS said the pick-up in earnings was driven mainly by the timing of bonus payments in the financial sector. Rising average earnings are a problem for the Bank of England's interest rate-setters because they may increase inflation, but the increase may not be big enough to be causing concern yet. "Despite the slight increase, the level of wage inflation remains well below the Bank of England's 4.5 per cent caution area," said Jonathan Said from the Centre for Economics and Business Research.